"Fighters of Justice," Batman and Mesa County District Attorney Dan Rubinstein at the Court Appointed Special Advocates swearing-in on Thursday. Fifteen new CASA volunteers took an oath to be the voice for children who have been abused. In 2016, CASA served 275 abused children. 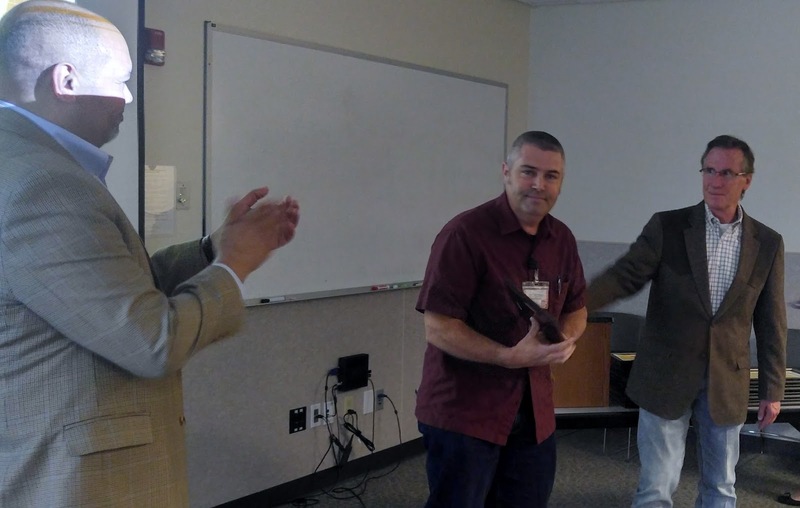 Mesa County Road & Bridge Shop (District B) staff Rick Purcell and Brent DePriest graduate from the Colorado Technical Assistance Program Road Scholar training course. The Roads Scholar I program started in 1991 and is designed to provide participants with the training necessary to increase their knowledge of transportation safety, local road maintenance, and construction procedures and improve their technical skills. News Channel 5 Meteorologist Rebecca Hykin interviews Mesa County Commissioner Scott McInnis about the new Red Canyon Pedestrian Bridge on the north side of Highway 340, between Mesa Grande Drive and Vista Grande Drive, that was installed recently to improve pedestrian safety. Mesa County officials in conjunction with the U.S. Geological Survey, Colorado Geological Survey, U.S. Forest Service, Department of Parks and Wildlife and state officials continue to monitor the West Salt Creek Landslide in preparation for spring runoff. The West Salt Creek Landslide struck the Grand Mesa almost three years ago, and it continues to be monitored by Mesa County and several other agencies. Mesa County Public Works Development Services Manager Dan Caris, Planning Division Director Linda Danneberger and Administrative Assistant Andrea Gorbett meet to prepare for of upcoming planning project schedules and events. Mesa County Operations Manager Connie Hahn has overseen approximately $29 million dollars awarded to Mesa County in transportation grants. 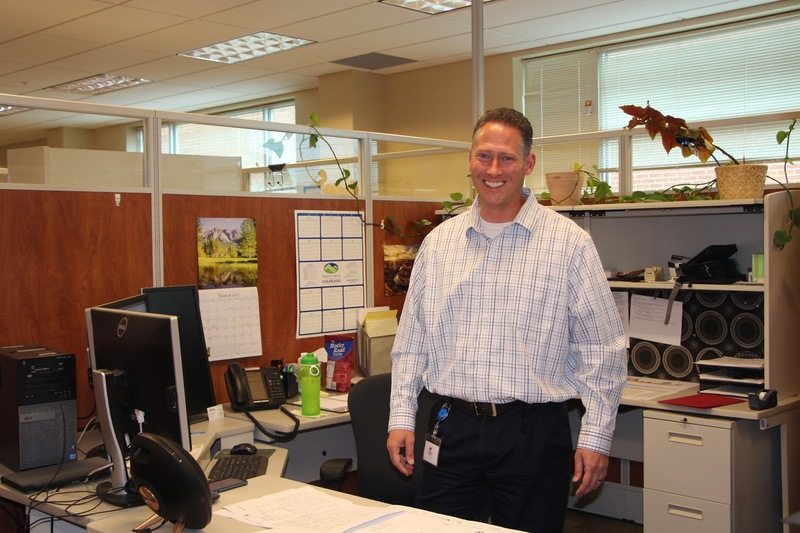 Scott Mai is Mesa County's new public works engineering director. Mai has worked for Mesa County as a senior engineer. Congratulations! From left, Commissioner John Justman and Mesa County Administrative Assitant Janika Harris at the Abatement Determination Hearing of the Board of County Commissioners. On Tuesday afternoon, the Board of County Commissioners conducted a public hearing concerning property tax abatements at the old Mesa County Courthouse, 544 Rood Avenue. Those present included Commissioner Scott McInnis, Commissioner Rose Pugliese, Commissioner John Justman, and Clerks to the Board Lori Westermire and Janika Harris. In Mesa County, the Board of County Commissioners has authorized the Assessor to settle abatements of $10,000 or less in tax, per schedule per year. When an agreement is not reached between the assessor and taxpayer, or the tax amount exceeds $10,000, a hearing is conducted at a tax abatement hearing before the board. Clerk and Recorder Sheila Reiner along with staff members hosted members of the SPICE homeschool support group for an up-close look at the internal operations of the Elections Department on Monday. Mesa County Elections Elections Coordinator Jesse Redmond talks to homeschooled students about the importance of voting and the process. The Elections team had fun teaching students the operation and procedures of their department. Agilis, better known as Dexter, can image, count, sort, and compare signatures accurately and quickly. Approximately 26 percent of voters have cast their ballot as of Thursday evening. Elections Director Amanda Polson talks to a group of home-schoolers on Wednesday about the special services voting offers to citizens who are living overseas or active military personnel, or a spouse /dependent of active military personnel. Homeschooled students from across the county take a behind-the-scenes tour of the Mesa County Elections office to see how ballots are processed and audited by Mesa County Elections team. Elections Manager Patti Inscho demonstrates how Dexter, a mail sorter with specialized software, opens and sorts ballots to an attentive group of home-schoolers. A group of Mesa County home-schoolers watch as Dexter—images, counts, sorts, and compares signatures. Health Promotion Specialist Karen Melott (left) and Child Care Nurse Consultant Heidi Belatti take a break for a photo at Mesa County Public Health. The pair work together to ensure the health and safety of children in child care facilities across Mesa County. Mesa County Public Health staff members use their break time to do some exercises as part of a workplace challenge. Front to back, Health Promotion Specialist Kelsey Fife, Health Promotion Specialist Troy Ward, Child Care Nurse Consultant Heidi Belatti, Health Promotion Specialist Emily Robertson, Data Analyst Shane Chatfield and Health Promotion Specialist Karen Melott. Major Mortgage collects items for the DHS Foster Care Bear Necessities Closet Program. From left, Foster Care Team Avrielle Walker, Kevin Cordova Major Mtg. Jeff Shely Foster Care Team, Kori McCoy & Julia Graddy Major Morgage. Children who come into the care of the county often times come with few or no belongings and without warning. These children often have nothing but the clothes they were wearing when the case worker arrived. Everything that is familiar to them gets left behind. They are frightened and feeling like their lives are beyond their control. The Bear Necessities Closet is designed to help a child in this circumstance. These kids are invited to “shop” for some personal items in the Bear Necessities Closet. 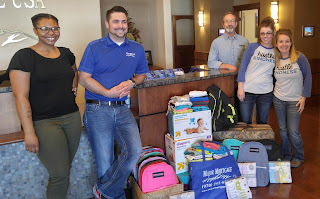 Thanks, Major Mortgage for the big load up for the Foster Care Bear Necessities Closet! Foster families often take children on a moment's notice. 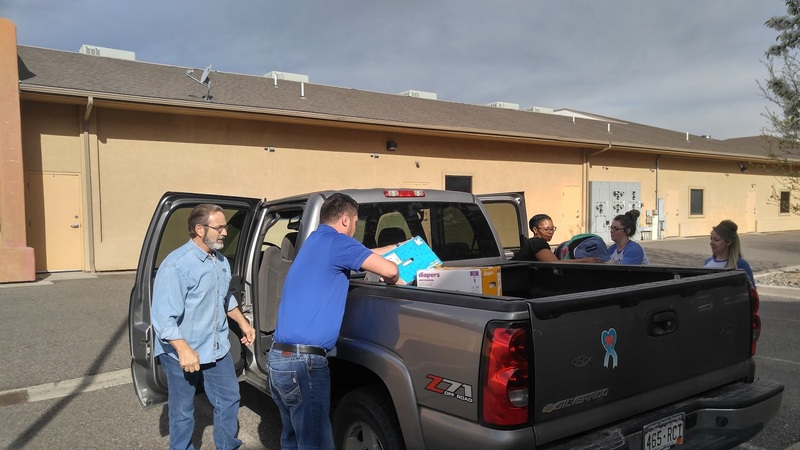 Without supplies from Bear Necessities Closet, often these kids would not have critical items such as car seats, formula, diapers, clean clothing, hygiene supplies and more. The Bear Necessities Closet, is a tremendous help to the families also, helping to alleviate some of the expense of taking in a child on short notice. Clifton residents and others are invited to an informal open house on Wednesday, April 5, from 3:30 to 6:30 p.m., at the Clifton Community Center, 126 2nd Street, to talk about the Bosley Wash Detention Pond Project. The open house aims to share information on the intentions of the project and gather citizen input. Community members are encouraged to attend and offer suggestions. Please join us! 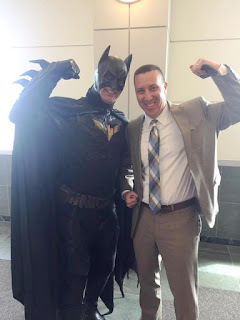 The DHS/WFC Economic Assistance staff celebrate their AWESOMENESS! 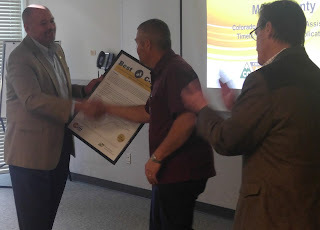 State Timeliness Recognition of the following: Mesa County is one of only 8 Counties in Colorado to achieve these numbers. Mesa County has processed at least 95% of their New Colorado Works Applications timely since February 2012. Mesa County has processed at least 95% of their Re-determination (RRR) Colorado Works Applications timely since February 2016. Mesa County has processed at least 95% of their New Food Assistance Applications timely since May 2015. 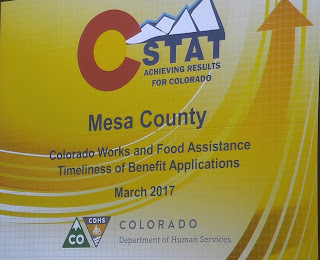 Mesa County has processed at least 95% of their Expedited Food Assistance Applications timely since September 2015.Mesa County has processed at least 95% of their Re-determinations (RRR) Food Assistance Application timely since September 2015. The Economic Assistance Supervisors: Shelley Grattan, Eudora Martinez, Michelle Trujillo Division Director, Cassie Kampf, Kim Petek, Joanne Hine, Jessica Marler. From left, Colorado State Director Reggie Bicha presents Mesa County DHS Executive Director Tracey Garchar the award for timelines. 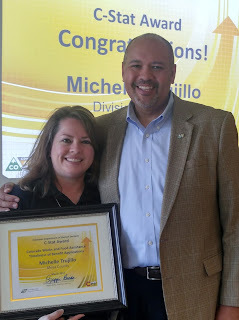 From left to right, Colorado State Director Reggie Bicha presents Mesa County Department of Human Services Executive Director Tracey Grachar with a C-Stat award. Mesa County Commissioner Scott McInnnis congratulates Garchar on the prestigious honor. Mesa County DHS Economic Assistance Divison Director Michelle Trujillo, left, receives a C-Stat Award for the Colorado Department of Human Service for Colorado Works and Food Assistance Timeliness of Benefits Applications. Quigs (short for Quigley) works for the Mesa County Public Works Engineering Department. 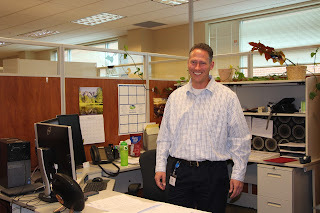 He is a stormwater specialist and gets paid in fish food. 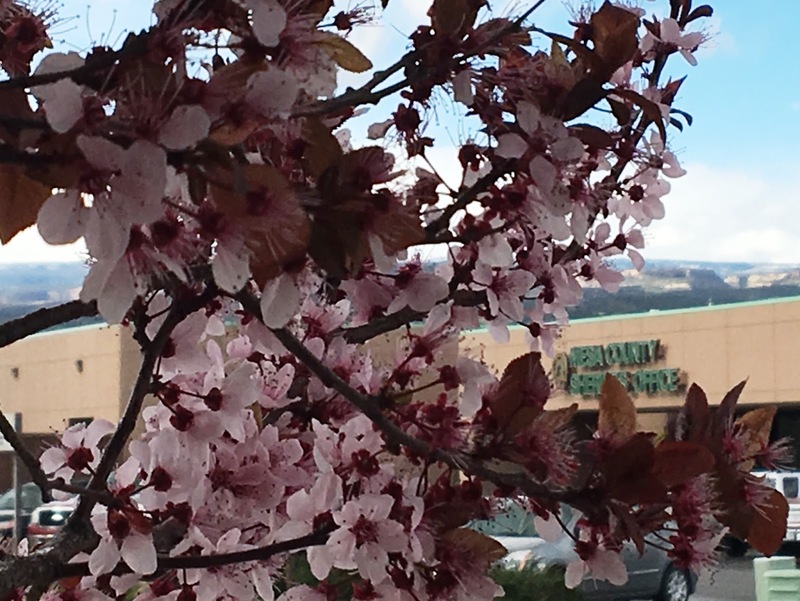 Spring flowers in full bloom at the Mesa County Sheriff's Office. 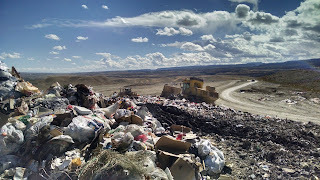 In support of spring cleanup efforts throughout Mesa County, the Mesa County Commissioners are sponsoring a FREE DAY of garbage disposal at the Mesa County Landfill, as well as the Gateway, DeBeque, Fruita, and Molina Transfer Stations. Gateway Transfer Station - April 1, 2017, 9 a.m. – 2 p.m.
Mesa County Landfill - April 8, 2017, 8 a.m – 4:30 p.m.
DeBeque Transfer Station - April 22, 2017, 9 a.m. – 2 p.m.
Fruita Transfer Station - April 29, 2017, 9 a.m. – 5 p.m.
Molina Transfer Station - May 6, 2017, 9 a.m. – 5 p.m.
ALL WASTE MATERIALS ENTERING THE LANDFILL OR TRANSFER STATIONS DURING FREE DAY MUST BE COVERED AND SECURED. UNCOVERED/UNSECURED LOADS WILL BE TURNED AWAY - NO EXCEPTIONS! In the event of high wind, please call (970) 241-6846 to check on the closure status of the landfill and/or transfer stations. Each facility is subject to closure during periods of high wind as mandated by state regulation and operational procedures. For more information, please call (970) 241-6846. 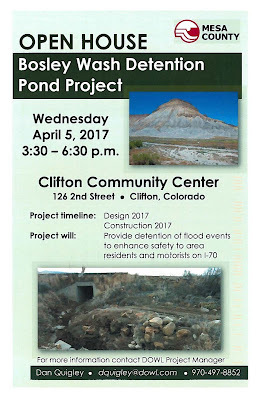 Clifton residents and others are invited to an informal open house on Wednesday, April 5, from 3:30 to 6:30 p.m., to talk about the Bosley Wash Detention Pond Project. Members of the design team from Mesa County and DOWL will be present to discuss the development and construction of the upcoming road improvement. The open house aims to share information on the intentions of the project and gather citizen input. Join us on Wednesday, April 5, from 3:30 to 6:30 p.m., at the Clifton Community Center, 126 2nd Street. Community members are encouraged to attend and offer suggestions. For more information, contact Dan Quigley at (970) 497-8852 or Carrie Gudorf at (970) 244-1811. Uncovered trash loads contribute to litter and safety issues along the roads of the Grand Valley. Per Colorado Traffic Code, spilling of loads on highways is prohibited and citizens must take measures to prevent it. That means all vehicles traveling to the Mesa County Landfill or related transfer stations must be covered and secured. For those who don't, fees will be doubled. Save your cash—tarp your trash!